Googgle and Verizon have gone public with their "policy framework" -- better known as the pact to end the Internet as we know it. News of this deal broke this week, sparking a public outcry that's seen hundreds of thousands of Internet users calling on Google to live up to its "Don't Be Evil" pledge. But cut through the platitudes the two companies (Googizon, anyone?) offered on today's press call, and you'll find this deal is even worse than advertised. 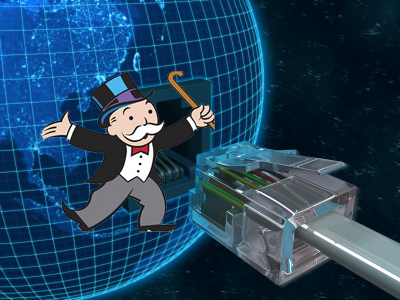 The proposal is one massive loophole that sets the stage for the corporate takeover of the Internet. Real Net Neutrality means that Internet service providers can't discriminate between different kinds of online content and applications. It guarantees a level playing field for all Web sites and Internet technologies. It's what makes sure the next Google, out there in a garage somewhere, has just as good a chance as any giant corporate behemoth to find its audience and thrive online. 1. Under their proposal, there would be no Net Neutrality on wireless networks -- meaning anything goes, from blocking websites and applications to pay-for-priority treatment. 2. Their proposed standard for "non-discrimination" on wired networks is so weak that actions like Comcast's widely denounced blocking of BitTorrent would be allowed. 4. The deal would allow ISPs to effectively split the Internet into "two pipes" -- one of which would be reserved for "managed services," a pay-for-play platform for content and applications. This is the proverbial toll road on the information superhighway, a fast lane reserved for the select few, while the rest of us are stuck on the cyber-equivalent of a winding dirt road. 5. The pact proposes to turn the Federal Communications Commission into a toothless watchdog, left fruitlessly chasing consumer complaints but unable to make rules of its own. Instead, it would leave it up to unaccountable (and almost surely industry-controlled) third parties to decide what the rules should be. If there's a silver lining in this whole fiasco it's that, last I checked anyway, it wasn't up to Google and Verizon to write the rules. That's why we have Congress and the FCC. Certainly by now we should have learned -- from AIG, Massey Energy, BP, you name it -- what happens when we let big companies regulate themselves or hope they'll do the right thing. We need the FCC -- with the backing of Congress and President Obama -- to step and do the hard work of governing. That means restoring the FCC's authority to protect Internet users and safeguarding real Net Neutrality once and for all. Such a move might not be popular on Wall Street or even in certain corners of Silicon Valley, but it's the kind of leadership the public needs right now. If you haven't yet told the FCC why we need Net Neutrality, please do it now. Is this the appropriate role for government… that is, oversight of corporate manipulations? The follow-up question is… does the FCC have the expertise to competently provide oversight?